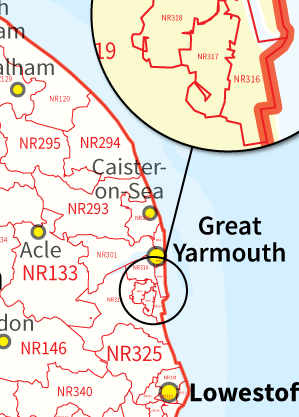 UK Postcode Maps and Vector Editable Outline Postal Code Maps of Great Britain. Powerpoint & Illustrator Vector Map Files. Our Vector Editable Postcode Maps of the UK are highly detailed editable maps when using something like Adobe Illustrator or Inkscape. Great for graphic designers but only if you know your way around those graphics packages. We’ve created a simple online tool that enables everyone to create, customize and colour a UK postcode map into Zones or Territories and save the result as a vector editable adobe acrobat pdf file. Create as many maps as you want for a small one-off fee. 124 Individual Postcode Areas divide Britain and make up the top level and largest geographical units of the UK postal code system. You can download a non-editable .jpg version of our UK Postcode Areas Map here for FREE. You can view the levels of detail supplied in our editable version by downloading this free postcode map. File types included with download. A UK vector postal code map made up of 124 individual shapes (including Guernsey, Jersey and Shetland Isles) this map is layered and labelled to make it easy to edit and colour yourself using freely available software. All the 2 character postcode area names are positioned in the centre of the postcode polygons for easy editing. This UK postcode area map covers the 124 separate GB postcode areas and also covers the counties of Southern Ireland. 1344 Towns and cities across the UK are also displayed on the map in their own layers. You can show, hide or change any of the elements in this map including changing the style size and colour of shapes and text. 3064 Postcode Districts cover the whole of Great Britain. This vector editable district map has selectable and customisable shapes for every one of the 124 postcode areas and 3108 postcode districts in the United Kingdom. Select entire postcode areas to colour by layer or select individual districts to customise the map in more detail. Includes Isle of Man. View Postcode District Map Info. Includes 1344 Towns and cities across the UK and Ireland, 3064 districts (and counties of Ireland)along with 124 postal code areas cover the whole of the UK in this map. This vector editable postcode area, district and towns map has selectable and customisable shapes and text for every corner of the UK using a vector editing package like Adobe Illustrator or the freely available InkScape. Postcode Districts & Towns Info. This london postcode area district sector map is fully editable using a vector editing software package such as adobe Illustrator or Inkscape. Showing all the postcode areas, districts and sectors in Central London. This map is layered in illustrator so it's possible to select all the postcode districts within a postcode area and customise them by changing colour, text style and colour etc. This map is fully editable using a vector editing software package. Showing all the postcode areas and districts along with motorways, a-roads, towns and cities. Also showing road numbers, junction numbers, airports, major rivers, lakes and waterways. Railway lines and motorway services are also an option. 124 Postcode Areas, 3108 Postcode districts and 11,200 UK Postcode Sectors make up our most detailed GB Postcode map. All shapes are vector editable and can be individually coloured and formatted. This is a very complex map and the files will require a powerful computer and Illustrator as a minimum. All 120 Postcode Areas in the UK are split up further into postcode districts. We've taken the huge step to release the entire postcode districts map dataset to the public completely free of charge for personal use. You can view and download vector based pdf postal code area and district maps of the entire UK here (as pdf). 9. Editable UK Postcode Area, District, Sector, Towns, Motorways, A Roads etc. This map is fully editable using a vector editing software package. Showing all the postcode areas, districts & sectors along with motorways, a-roads, towns and cities. Also showing road numbers, junction numbers, airports, major rivers, lakes and waterways. Railway lines and motorway services are also included. © 1999-2018 GBMaps.com. All rights reserved.